How many should I draw? How many loss of life? Whispering Madness Blood Scrivener, I draw how many? 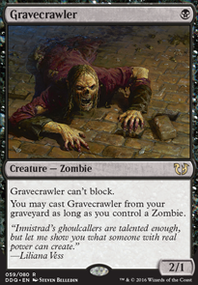 The discard/cycling section on EDHREC https://edhrec.com/themes/discard has a lot of nice things to look into, for example, Shadow of the Grave turns that filter from Varina into outright draw, Blood Scrivener is a 2 cmc zombie that acts like a Phyrexian Arena if you're dumping your hand to 0 (though I will say that's a risky prospect and the arena is more survivable). 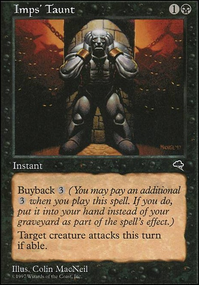 it always feels off to brush off/disregard mana acceleration... but currently you dont seem to need it? 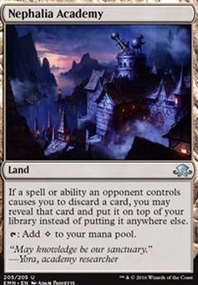 maybe if you were running a big beautiful sorcery like Rise of the Dark Realms or more 5+ CMC stuff like Dictate of Erebos something then i could see it... but as is i think you would be better off putting in some draw spells/engines. 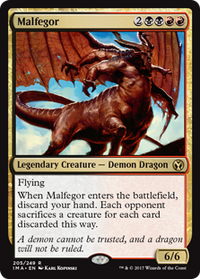 Some budget options i can think of are Phyrexian Arena / Blood Scrivener / Null Profusion or even Night's Whisper / Altar's Reap . It has been SOME time since I updated this deck (though I have been in real life and just not on here). I removed some of the additional spells in the main in favor of packing in more creature muscle. 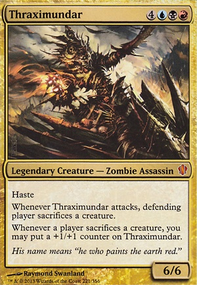 I moved the Thoughtseize to the sideboard and am going to try out 2x Ammit Eternal and 2x Blood Scrivener . I like the way Ammit hits hard for three mana, hits my opponent even when blocked, and can be a target for Plague Belcher 's -1/-1 counters while possible being able to shrug them off with a hit! I'm willing to give it a shot. 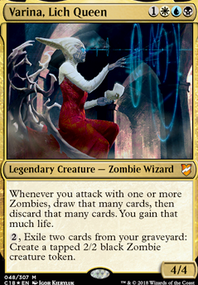 I don't want to slot in pure card draw spells and lose steam in the creature ranks, so I'm giving Scrivener a shot. I took out the Abrupt Decay in favor of Assassin's Trophy . I like the more catch-all aspect of it. I also included a single Tragic Slip for anything annoying that's hard to just flat out hit with Assain's Trophy. I'm lookin' at you, you annoying Eldrazi. Lotleth Troll has been amazing in play so I bumped him up from 3 to 4 in the main. Lastly, I tucked 3x Gray Merchant of Asphodel in the sideboard for long-running matches or, I dunno, Ensnaring Bridge hijinks. We'll see what this does this weekend! Always open to suggestions! Please! this looks both fair and fun... 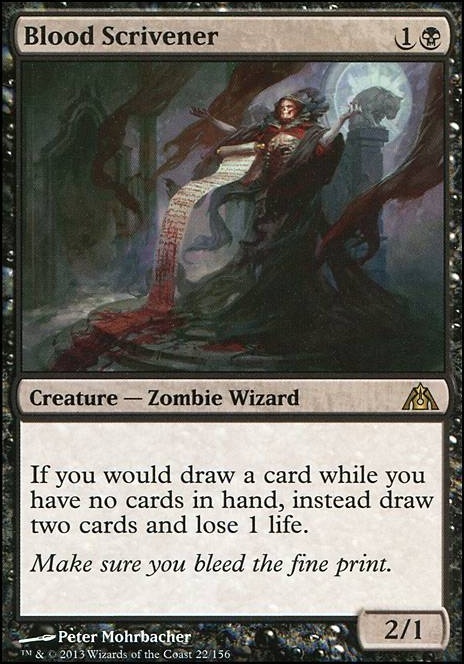 Blood Scrivener can be a nice draw engine to consider as a 1-2 of.